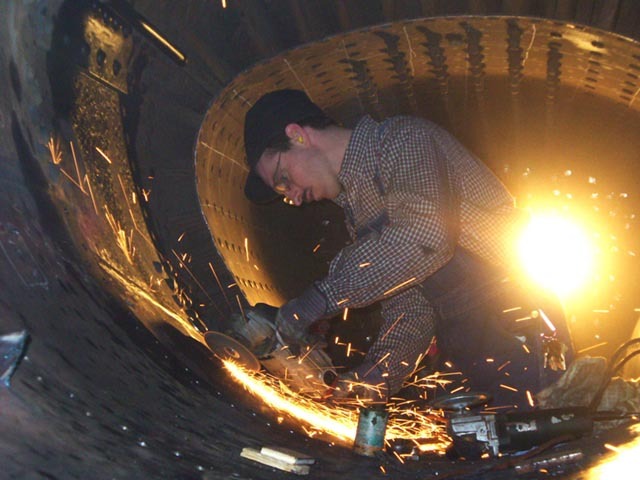 “For the third weekend in a row work has been happening in the shop. 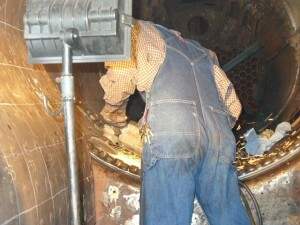 With the stress relieving completed back in January, we are able to move forward to complete the barrel seams. This is the number one priority on the boiler for us. 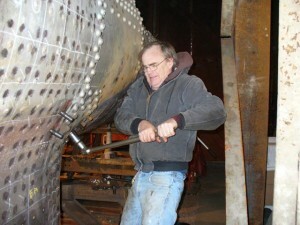 The goal is to rivet all of the barrel seams during Spring Fling weekend. 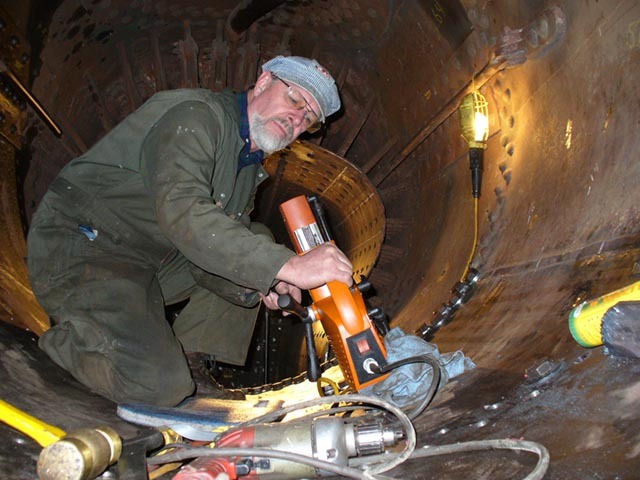 This ‘seams’ like a big goal, but there are only 175 holes to bore, bolt up tight, ream, and rivet. “We made great progress on the rivet seams. The seam between the throat sheet and third course was completed. We were also able to complete approximately 50% of the seam between the second course and third course. 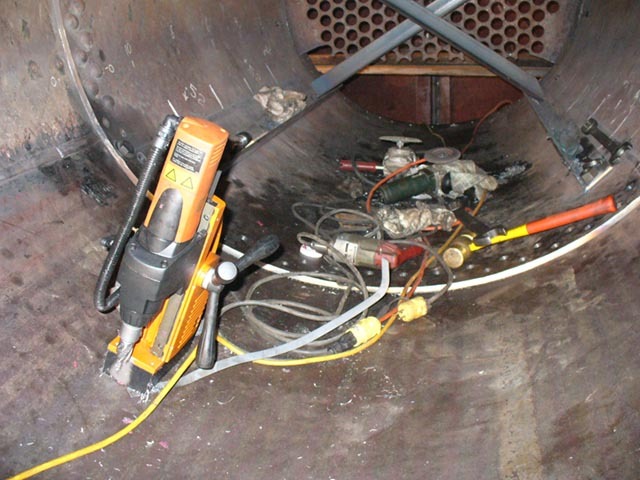 This means we are approximately 50% completed with hole boring and bolt up. “Next weekend we need to make a new throat sheet backer. This is number two priority. I would like to have this riveted in during Spring Fling or before so that the stud hole can be completed in it and this area ready for rear tube sheet installation. We have the code material at the shop and the old one for a pattern. “Plans have been progressing in preparation for Spring Fling weekend. A new rivet forge has been purchased. Jim Connor picked it up and delivered it to the museum. We have a local source located for LP so we can rivet like mad and not run out of fuel. The required rivets for this task have been ordered and will be shipped in time for Spring Fling. We are compiling a list of other requirements and are working on procuring these items so we are prepared for riveting. “The rear tube sheet template was shipped to the sub-contractor and a P.O. issued to make the rear tube sheet. The hope is to have this back by Spring Fling so tube holes can be bored in and it shipped out for heat treatment. “Once the riveting is completed, the throat sheet backer is installed and stud hole drilled in the throat sheet backer we can start to fit the rear tube sheet. 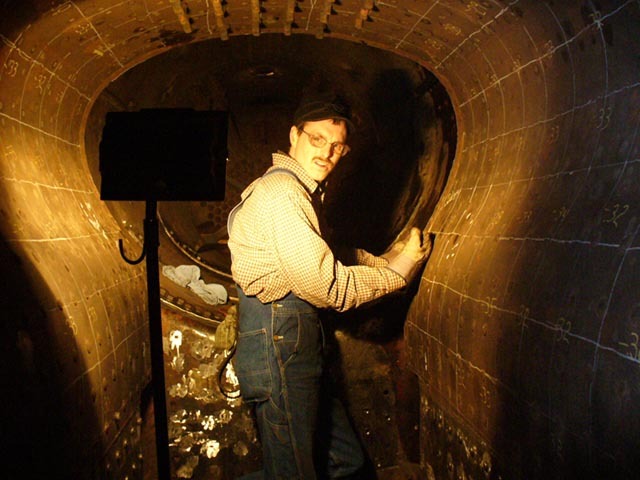 “While this work progressed I spent some time looking over the tender tank. Discussion and ideas for repair were discussed so a plan of attack can be put fourth.